Our Bricklaying products provide you with a perfect blend of Cockburn Cement and Hylime (builders hydrated lime) that conforms with an M3 Australian Standard classification. All that you need to do is add the sand and the water. For estimating your requirements please refer to our easy estimator or try our calculator located in the side panel. Check out our Home Builders Guide where we have listed the best products available in WA and where to use them for the best result. 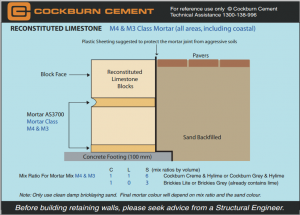 See our Guide for laying reconstituted limestone blocks for more information.